An intimate narrative delving into the personality of Secretariat and the traits that made him such a special champion. Author Bill Doolittle gives a delightful and engaging account of Secretariat through the remembrances of the Meadow Stable team. It’s an interesting quirk of history that Secretariat lost three races during his historic Triple Crown year in 1973, but each time he lost he came back to break a track record in his next race. Secretariat lost the Wood Memorial in April, but roared back to take the Kentucky Derby in track-record time. In August, after sweeping the Triple Crown, he lost to a horse named Onion at Saratoga, and then in September to Prove Out at Belmont. After each of those losses he not only rebounded with track record victories, but the clockings he recorded also established new track records for the distances and surfaces. Which didn’t surprise exercise rider Charlie Davis one bit at the time, and doesn’t surprise him today. Which is a terrific story, but equine experts say horses don’t actually possess that kind of reasoning ability. They don’t feel guilty somehow and work up a determination to do better next time. That’s strictly a human trait, the experts say. After each of those losses, Davis says he and groom Eddie Sweat knew exactly what to do: Nothing. They let their big horse work things out for himself. “We’d just leave him be the next couple days,” Davis explains. But when Secretariat returned to the track to train for his next race, Davis would be ready. 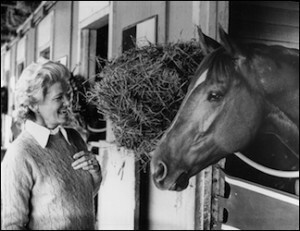 The Whitney race was followed by the historic Marlboro Cup at Belmont Park, in which Secretariat defeated a star-studded invitational field that included Kentucky Derby-winning stablemate Riva Ridge and West Coast champion Cougar II. Secretariat’s clocking of 1:45 2/5 for 1 1/8 miles was the fastest in history at that distance. When he avenged his loss to Prove Out, he stopped the clock at 2:24 4/5, the fastest 1 ½ miles ever recorded on grass. It was Secretariat’s first start the turf. Jockey Ron Turcotte, who was aboard “Big Red” for all those races – the wins, the losses, and the track-record comebacks – says there’s a more logical explanation. The Wood-Derby turnaround, he says, can be explained by the simple fact Secretariat had been suffering with a painful, but undetected, abscess in his mouth. After the abscess was spotted, trainer Lucien Laurin, groom Eddie Sweat and Davis went to work on the problem with old-fashioned horse remedies. The painful problem was fixed – and nothing could stop Secretariat in the Kentucky Derby. After settling to last place after the start, Secretariat picked up steam and proceeded to run each quarter mile faster than his previous quarter mile – a horse on a mission, and an astonishing feat that long-time observers said had never been done in the Kentucky Derby. Even if horses are passing others, they are generally not running as fast (or faster!) at the end as at the beginning of the race. Especially in the long and grueling Run for the Roses. But Secretariat did. His 1 1/4 miles was timed in 1:59 2/5. Still the Kentucky Derby standard. Maybe he was trying to prove something. Secretariat wasn’t a bad actor, Gaffney says. He just felt good. Jockey Eddie Maple, a top rider of the era, rode Secretariat just one time – his last race, when Turcotte was serving a suspension for a riding infraction. Just one race, but one Maple says he won’t ever forget. It was one of those cases in which a top rider knows better than to fight his mount. “We crossed the dirt with no problem and headed into the stretch. I tapped him with the stick left handed and he just sailed away.” Secretariat suddenly opened up a huge lead and cantered to the wire. Victorious in his final race! Like Turcotte, Maple doesn’t go too much for ascribing human traits to horses. But hadn’t Maple said Secretariat got “mad” about rating next to another horse in the Canadian International? Davis and Eddie Sweat did, of course, spend all their time with Secretariat. The horse didn’t need a guard, Davis and Sweat never left him unattended. If one went for sandwiches the other stayed around. The only other soul Secretariat expected to have around was Billy Silver, the stable pony. “He always would look around, look around, and then when he would see Billy Silver he would be fine,” says Davis. Bill Doolittle is a well-known Louisville journalist and the author of the best-selling “The Kentucky Derby: Run for the Roses,” with forward by Walter Cronkite. He compiled many of the stories and historical notes about Secretariat for this site.